My father-in-law was editor of The Lancet. Though long retired, he is still a stickler for meaning what you say and saying what you mean. He remembers the Daily Express headline at the time of El Alamein which lacked an all-important comma: “8th Army Push Bottles Up Germans”. Another headline during World War II that made him laugh was “Monty Flies Back to Front”. Here are some interesting facts about punctuation. In Roman times, writers did not punctuate. “The marking of pauses in a copy of a text was normally left to the initiative of the individual reader who would insert them, or not, according to the degree of difficulty presented by the text, or the extent of his comprehension.” (M B Parkes, 1992). Until approximately the eighth century, writers did not use spaces between words. Until the middle of the nineteenth, punctuation in books was usually determined by the printer rather than by the author. Then there are those wonderful mistranslations such as this one seen in a Moscow hotel: “You are welcome to visit the cemetery where famous Russian and Soviet composers, artists and writers are buried daily except Thursday.” Or this one at a tailor shop in Rhodes: “Order your summer suit. Because is big rush we will execute customers in strict rotation”. 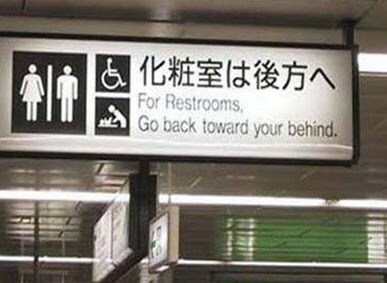 Or this photograph of a Korean sign with its hilariously accurate, but unintended, English translation: “For Restrooms, Go back toward your behind.” Tautology or what?